THE SUN IS SHINING…BRING YOUR REGGAE PLAYLISTS, PUT ON YOUR AVIATORS AND FEEL THE LOVE. Sun is shining, the weather is sweet..
With rooms full of hand-carved furnishings, exotic fabrics and authentic art, you feel like you are staying at the original vacation home. Make sure you take the time to tour the entire space. There is so much memorabilia and such a warmth and uniqueness to every room. Don’t forget to stop by Marley’s Boutique for music, merchandise and even Cedella Marley’s own high-end fashion wear, “Catch A Fire”. Make sure to book your private treatments at the Natural Mystic Spa. 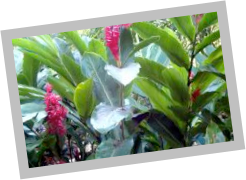 This retreat was inspired by Rita Marley’s philosophies and provides Afro-Caribbean and Asian techniques, hydro-therapy and traditional Caribbean rituals to relax your body and renew your soul. Who doesn’t need that? You will definitely want to stay at the hotel to eat while you are here. 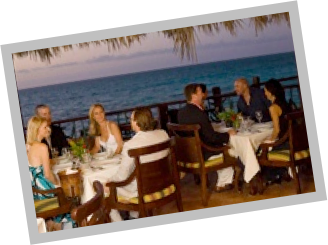 The Simmer Down restaurant overlooks the ocean and has award-winning chefs cooking up mouth watering eats. I am still craving the fresh Marley Mixed Salad with toasted coconut, candied pecans and bursts of citrus. You will also want to save room for dessert. Their Tropical Junkanoo Consume with chilled Ginger Vanilla Syrup and Pineapple Won Tons are to die for, but to be honest, we felt that way about everything on the menu. The entire experience at this resort was so memorable. I cannot wait to go back. 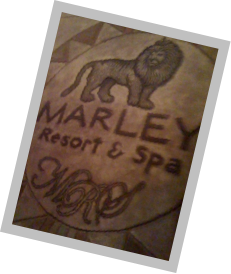 An added bonus for all you Marley lovers (myself included) is that this resort is still considered a home away from home to the Marley family, so you never know when you might be dining right next to one of the clan. One love, indeed. As a general rule of The Hip Traveler, we believe in having a soundtrack to your travel experiences. Here in the Bahamas, music is so deeply woven into their daily lives that you can find it’s influence throughout the island. 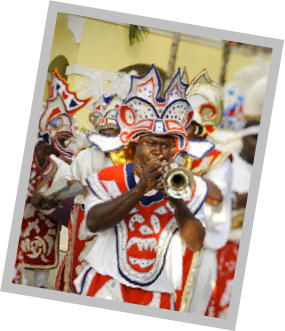 From a Bahamian flavor of Blues found in the churches to the danceable Goombay drums, copper bells and mouth whistles that can be heard during performances at Junkanoo. 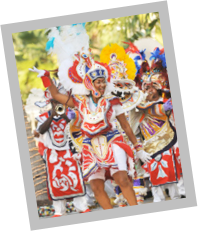 If you make it to the Bahamas during the holidays, Junkanoo is one festival you definitely do not want to miss. It starts during the dark hours of December 26th and the celebration continues through New Year’s Day. What began as a temporary celebration for slaves who were given three days off for Christmas has now become a national tradition with elaborate dance routines, costumes and festivities. But don’t worry if you can’t make it for the holidays, plenty of nightspots feature the traditional performances. DON’T MISS THE SEA CAVES AND HUGE CLIFFS OF CLIFTON PIER, WHERE PIRATES LIKE BLACKBEARD ONCE TRAVELED. There is so much culture and history in the Bahamas, that even the traveler seeking a tropical vacation filled with white sandy beaches and Pina Coladas will want to take a day from the surf. In Nassau, there is an abundance of Colonial architecture and so many historical hidden gems, that you can spend an entire day walking and exploring. From the six-panel painting representing the history of the country at the Bahamas Historical Society Museum to the “Bahama Mama” exhibit at the National Art Gallery of The Bahamas, you will start to get a glimpse of the real spirit of the country. e Water Tower at the top. 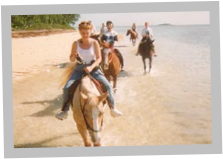 For those of you that prefer to let someone else do the walking, try horse back riding at the beach to allow your mind to escape to another time. 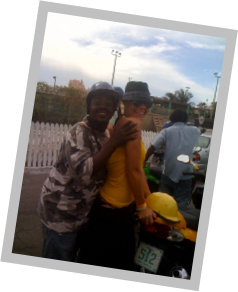 Of course, as a free spirited traveler, I highly recommend the the moped scooter for self guided tours around the island. Just keep in mind that you need to travel on the left side of the road and these high powered scooters are more like motorcycles that go over 35 miles an hour. Not for the faint of heart. As if the Bahamas wasn’t already an escape, this is something for those interested in a sustainable splurge away from it all. 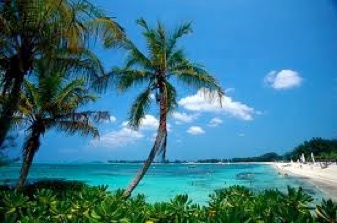 The largest, yet least developed of all of the islands is Andros Island. 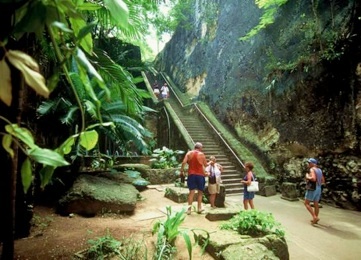 This is the place to truly get away from everything and experience the natural wonders of our planet. There is so much to experience on Paradise Island/Nassau, the capital of the Bahamas, but this is worth the 15 minute journey from Nassau. 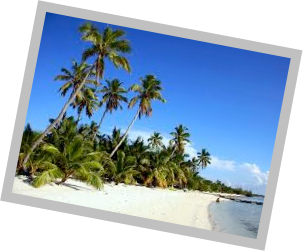 I have even considered skipping Nassau on my next trip and flying straight from Fort Lauderdale into Congo Town where you can clear customs and immigrations and save a day of travel. At Andros Island, you can see the world’s third largest barrier reef just adjacent from it’s shores, along with underwater caves and a mile deep abyss filled with marine life from dolphins to reef animals. This is a place where you can surround yourself with nature and truly let go. I recommend staying at the Tiamo resort when you are at Andros Island and indulging in their “guilt-free, eco-chic living” with sea breeze air conditioning and cottages made from sustainable pine, raised on stilts for maximum ventilation. 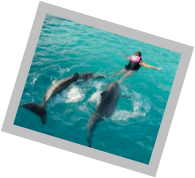 Once you are nestled in, you can plan your tip with snorkeling, diving, sailing or nature tours. Of course, to add to it’s sustainability claims, this resort has it’s own boat and guide to take you fishing for your own dinner. I could really get used to this kind of living. Avoid the Atlantis Resort. It feels like your on vacation with your family in Vegas..yet in the Bahamas. Bad idea. Make friends with the locals. They will give you the inside scoop. Just beware of hustlers. Experience the local music. Find out what Rake ‘n’ Scrape & Goombay sounds like. Charter a small aircraft with friends to explore the other islands.